Don’t miss our spring presentation of “Carmina Burana” on May 4th & 5th featuring three of Vermont’s best soloists! A combined chorus of close to 100 singers will be accompanied by two pianos and percussion. “Carmina Burana” begins and ends with the dramatic and stirring “O Fortuna”, which has been featured in many films, such as “Excalibur”. We hope to see you there! 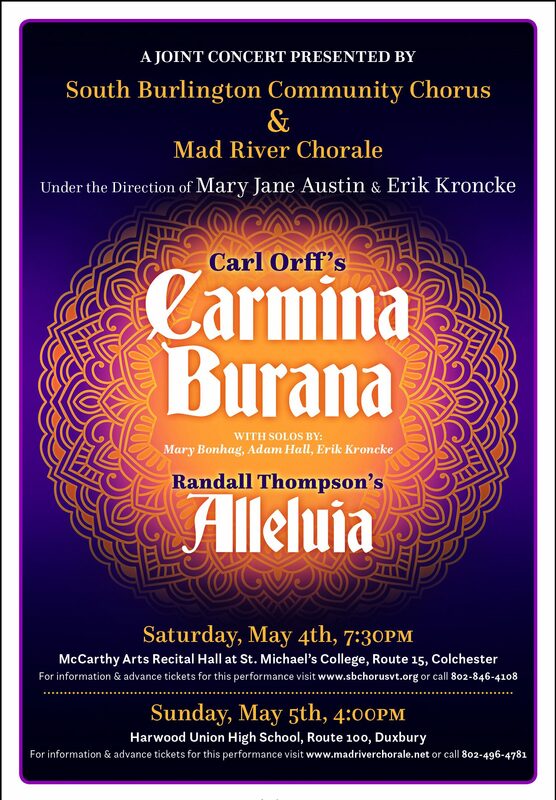 To purchase tickets online for the May 4th performance of CARMINA BURANA at St. Michael’s College please visit this page. To purchase tickets online for the May 5th performance of CARMINA BURANA at Harwood Union H.S. please go to the Mad River Chorale website.